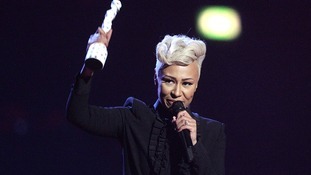 Emeli Sande and Ben Howard were among the big winners of the night at this year's Brit Awards, winning two gongs each. Sande scooped the first award of the night, winning best British female. The Scottish singer - who won the Critics' Choice award last year - then followed up with the biggest award of the night, winning best British album for Our Version Of Events. It clocked up sales of 1.39 million in the UK last year. ITV News Correspondent Nina Nannar reports. Many people had not heard of Ben Howard until this evening but after winning both best breakthrough act and best British male, he is the name likely to be on everyone's lips. Howard had found little mainstream success until his inclusion on the Mercury Music Prize shortlist last year. As he collected his first award, he said: "I'm not very good at speeches. I'm not very good at dancing." This is bizarre, isn't it? I didn't really expect it. I'm quite stoked to even come to the awards, so to come away with two of these is amazing. Adele's Skyfall - which is the theme tune for the latest Bond film - won best British single. The singer was not there to receive her award, but in a video she made a joke at the expense of last year's awards when her Best Album acceptance speech was cut short. 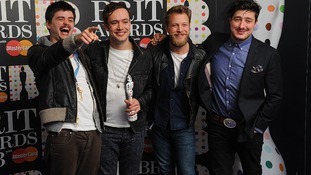 Mumford & Sons picked up the prize for best British group. It was the band's second Brit win, having collected the best album prize in 2011. Frontman Marcus Mumford said: "Thanks very much indeed. We weren't expecting that. I don't think we've really taken the opportunity to thank people who have come to our gigs. Read more about The Brits on their official website. The UK's biggest night in music will be celebrated this evening as the Brit Awards come to London's O2 Arena. Damien Hirst will have Brit Award winners seeing spots before their eyes after decorating this year's trophy with his signature design.